This solid crystal award is an elegant way to recognize achievement. Design work and custom laser engraving are included. This striking crystal tower award is available in 8", 10", and 12" heights. Design work and custom laser engraving are included with your purchase. 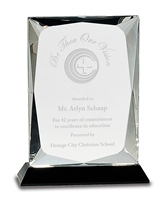 This solid crystal award in a teardrop shape is 8 inches tall and a very elegant way to recognize achievement. Design work and custom laser engraving are included. This classic and elegant design is a great way to recognize employee achievement. Design work and custom laser engraving are included. 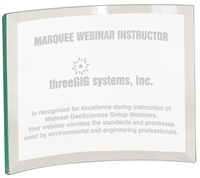 This elegant crystal tower with laser etched globe is a great way to recognize superior performance on global projects and is available in 3 sizes. Design work and custom laser engraving are included. This elegant crystal wedge award is available in both 8 and 9 inch sizes. Design work and custom laser engraving are included. Floating Glass Plaque - 9x12"
This 6x8" glass crescent is an affordable but elegant way to recognize achievement. Design work and custom laser engraving are included. Design work and custom laser engraving are included.